Fukushima Prefecture is famous in Japan for its sake production. In fact, this prefecture has won numerous gold awards for best sake in Japan for six consecutive years. Learn to appreciate sake at three local breweries: Kokken, Shike, and Watanabe. The Japanese sake award-selection contest is held annualy and is a competition only the most prestigious sake brands get to compete in. It is known as Japan’s Excellent New Brew of Sake Awards Ceremony (Zenkoku Shinshu Kanpyokai). This ceremony has a tradition of over one hundred years. More than 800 sake makers present their best sake brands here. However, in recent years Fukushima-made brands have received a lot of domestic attention. In fact, for the first time in Japanese history, Fukushima has been winning the most prestigious awards, from 2013 to 2018. 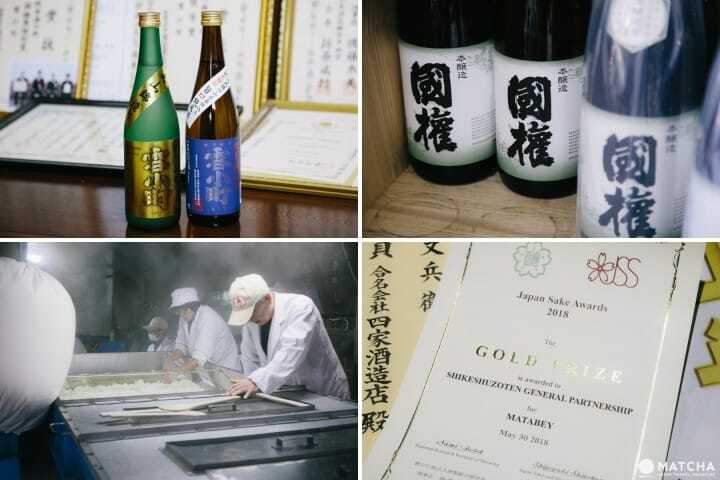 In order to learn the secret behind this success, we have visited three sake breweries that won the gold medal in 2018. We were surprised by what we heard from the sake brewers making these masterpieces. We found out that the local brewers were not trying to make a type of sake that takes the spotlight and alters the taste of food. They instead want to create sake that supports the dining experience. The result is a sake that is moderate but still has the power and taste to captivate its drinkers. Now, let us discover and explore the world of Fukushima sake. 1. Kokken Sake Brewery in Minamiaizu - 11 Years of An Award-Winning, Refined Taste! It is 8:30 in the morning. It was a brisk morning in late November, which makes one realize the winter is really here. However, the cold didn’t stop the employees from working beneath the rising cloud of white vapor. Our first stop is Kokken Sake Brewery (Kokken Shuzo). Their sake brand Kokken has been the gold medalist of Japan’s Excellent New Brew of Sake Awards Ceremony for the past 11 years (2008-2018). This sake can easily be considered representative of Fukushima. Today we exclusively got the chance to explore the shuzo, or the sake brewery, ourselves, and learn about the brewing process. Below we will introduce the sake-brewing method of Kokken Brewery! The whole process starts with steaming the rice. Japanese sake is an alcoholic beverage made from rice. The rice used in this process is special and not the rice we eat everyday. Sake rice, called sakamai in Japanese, is easily steamed and therefore used for brewing purposes. After being steamed, the rice is cooled down in the horeiki, or a cooling machine. Then, workers top it with koji mold (*1). At this point, the rice temperature is extremely important, and has to be neither too cold nor too hot. *1 Kojikin (koji mold): a microbe that is said to exist only in the East. It is an indispensable part of Japanese cuisine, used for centuries for making soy sauce, miso, sake, and other products. Workers estimate the optimal temperature, then pack the rice into the bags as promptly as possible and store it in the koji-room (kojimuro). The next step is to maintain the koji room temperature at the optimum level in order to create the ideal environment for the bacteria to multiply. It takes two to three days for the koji mold to completely grow. While the mold is growing, employees make the yeast starter (shubo). The mixture of yeast, lactic-acid bacteria, koji mold, water, and other ingredients, are put inside a small tank for fermentation. The yeast starter will make the fermentation go smoothly for making sake. After a Month-Long Fermentation, the Process is Complete! It is finally the finale of the brewing process! The above-mentioned yeast started, together with the steamed rice, koji mold, and water, ferments in one giant tank. During this stage, the process is broken into three stages, since the fermentation would take longer to complete if it was all fermented at one time. The mixture at this stage is called moromi. You can already smell the scent of sake coming from the facility. To make delicious sake, over a long time the mixture is occasionally stirred and the temperature adjusted. After the sake has fermented over a period of two weeks up to a month, the beverage is filtered from the mixture, and the sake is ready to be enjoyed! Kokken Brewery is in the Minamiaizu area in Fukushima. In the winter, it is known as a snow kingdom in Japan and has a long and harsh cold season. The water used at Kokken Brewery for making sake is actually meltwater. Kokken utilizes the clean and tasty Minamiaizu water. The first thing you will notice as the glass reaches your mouth is the light and invigorating aroma that will seduce you. Next, you will note the smooth texture that results from using the meltwater. Finally, the aftertaste leaves you refreshed and wondering why your sake cup emptied so quickly. The company president, Mr. Hosoi, standing at the entrance to Kokken Sake Brewery. Mr. Hosoi tells us while laughing, “I'm aiming to create the Kappa Ebisen version of Japanese sake”. Kappa Ebisen is a classic and popular Japanese snack. Its slogan is “Yamerarenai, tomaranai” (roughly translated as “Can’t stop, can’t get enough.”). This is sake that makes you want to drink more and more. The steam given off during the sake process that makes Kokken so delicious continues to rise every day from the brewery, rising up in the sky in heavy white clouds. Access 5 minutes by foot from Aizu-Tajima Station. *You can purchase the sake at the shopfront. However, it is not possible for visitors to tour the brewery. Next, we will introduce Shike Shuzoten, or Shike Brewery. They make Matabe sake, an alcohol hardly seen anywhere outside Fukushima. Matabe won the first prize award at Japan’s Excellent New Brew of Sake Awards Ceremony 15 times, serving as proof of its quality. Around 95% of this sake is consumed in the Iwaki region, where this sake is produced. This is truly a local sake that is hard to find outside of this area. We were surprised by the sturdy and thick gate to the brewery, since the building is 100 years old and has been repaired many times during the brewery's operations. Shike Brewery is located in the Iwaki area in Fukushima. Kokken Brewery is known for its winter and snow scenery, but Iwaki has a relatively warmer climate in comparison, as it is situated near the coast. This area is not considered sake-brewing friendly, and there are only one or two more breweries other than Shike Brewery in this area . Founded in 1845, this brewery has been making Japanese sake for Iwaki residents for more than 170 years. The facility will make you feel like you've been taken back in time, with fixtures like a pulley on the second floor that was used long ago to transport items. Considering the great temperature difference in the Iwaki area, workers pay special attention to the temperature adjustment during the brewing process. The brewing season starts at the end of the year and lasts through spring. This period is when the special workforce called toji (the sake brewers) from nearby Iwate Prefecture start working and come stay at the brewery for about half a year. When we visited, the yeast starter was foaming like it was really alive. The sweet and fruity scent enveloped the space around us. The special trait of Matabe made by Shike Brewery is its refreshing aroma. Iwaki is near the ocean, so locals seem to prefer fresh and clean sake aromas that compliment the seafood. According to the president of Shike Brewery, Mr. Hisao Shike, you can make delicious, sangria-like sake by using pears grown in Iwaki. We noticed the fruity taste of the sake at first, but the lingering aftertaste is refreshing and not too sweet. It is delicious and makes you yearn for another glass. You can see the awards on display at a corner of the brewery. Why isn't this sake for sale across the country, considering its superb taste? When we asked Mr. Shike, he replied, “he isn't that good with ‘those kinds of things,'" with a somewhat bitter smile. Still, the taste of the sake speaks for itself. It is easy to see why many fans from all over the country, including famous actors, are charmed by this sake and keep placing orders for this beverage. Matabe is a sake brand hard to find outside of Iwaki. It takes only one sip to understand why the locals keep this treasure to themselves. Make sure to visit Iwaki where you can try this delicious sake for yourself! Business Time 9:00-17:00 *This is not a shop location. It is not possible for visitors to tour the brewery. Access 10 minutes by car from JR Iwaki Station. *This is not a shop location. It is not possible for visitors to tour the brewery. You can enjoy sake from Fukushima with without a single worry. Mr. Yasuhiro Watanabe of Watanabe Brewery Main Store works hard to help customers savor this alcohol with confidence. Mr. Watanabe collected the data himself, and visited the local households (farms). Mr. Watanabe was the supplier of rice for brewing sake at the Fukushima Prefecture Sake Brewers Association when the accident at Fukushima Daiichi Nuclear Power Plant happened in 2011. “The first thing we should investigate the safety with numbers," is what Mr. Watanabe thought first. The three Fukushima breweries were surveyed quickly, and the numeric values showed there was no problem with the breweries about ten days after the accident. Mr. Watanabe has also studied pedology (soil science) at the university and was well-informed about the possible effects of the radioactive material on the soil and crops. Thanks to his expertise, he was able to act quickly and adapt to the difficult situation. Mr. Watanabe’s other worry was about producing rice safe for consumption. Rice is very important for brewing sake. After the accident, rice producers in Fukushima worried about if cesium, a type of radioactive material, would have a bad effect on the rice. However, Mr. Watanabe noticed the similarities between cesium and potassium that is used in producing fertilizers. He realized that he could use potassium-based fertilizers to control the absorption of cesium. Mr. Watanabe told farmers all over Fukushima to use potassium-based fertilizers. Thus, the level of radioactive material detected in this rice was not higher than the usual standards. This is the same for the sake made from that rice. Currently, up to 100 Becquerel (Bq - a unit of radioactivity) is allowed per 1 kg of radioactive cesium according to the safety standards for the general food products (including sake) determined by the government of Japan. This standard is much more strict compared to Europe (1,250 Bq/kg) and in the United States (1,200 Bq/kg). Futhermore, for Fukushima Prefecture, the safety standard is the strictest of all: 10 times stricter than that decided by the government. Only up to 10 Bq per 1kg is allowed in this case. There hasn’t been a single case yet (post-accident) of these standards not being met. Yukikomachi is the sake that Mr. Watanabe makes, which uses rice from mainly Fukushima Prefecture (more than 95% of the rice used is Fukushima-produced). Mr. Watanabe says that making sake is similar to raising children. If you notice that the temperature of the mash tank is lower than it should be, you’ll get up at night to layer it with mats until the temperature is right. “The sake maker pours their heart into the sake they are making," says Mr. Watanabe. One gulp of Yukikomachi, made with love, will give you a sample of the delicious taste. You could easily end up drinking all of it until it’s gone. However, you don’t have to worry about getting a hangover. “We are pursuing making sake that won’t make you drunk”, says Mr. Watanabe. It appears that the expertise, combined with the carefully collected data, resulted in a recipe for easily-digestible sake. The formula, of course, is a company secret. They continue to aim for safety and the tastiness in their sake, based on precise measurements and data. Business Time 9:00-17:00 *This is not the store location. The brewery is not open for tours. Access 10 minutes by car from JR Miharu Station. 25 minutes by car from JR Koriyama Station. *This is not the store location. The brewery is not open for tours. Try the Amazingly Tasty Fukushima Sake! Fukushima is Japan’s third-largest prefecture and therefore has very different environments and prerequisites for making sake depending on the region. With award-winning sake for six consecutive years, the quality of the sake made in each area and brewery in this prefecture is extremely high. The sake is gentle and subdued but still awes people with its tasty aroma. Come to Fukushima to try the finest Japanese sake! Familiarize yourself with this delicious beverage by going to Fukushima Sake Story's website showcasing sake with videos and easy-to-understand explanations. Fukumitsuya Sake Brewery in Kanazawa - Learn How Premium Sake Is Made! Drink Up At Sakenojin, Niigata's Annual Sake Festival!